"London, Summer 2005. On a rather grey Wednesday afternoon in July, the British capital is chosen to host the Olympics Games of 2012. The atmosphere is jubilant. A couple of hours later four suicide bombers arrive in the city. Mission: to kill as many people as possible. 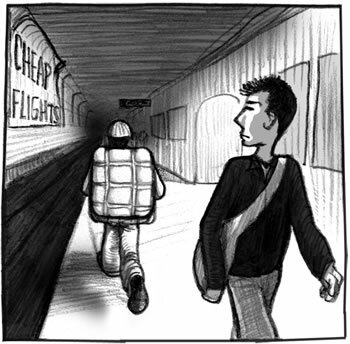 In Transition is a graphical account of that fatal day ending up in the metro deep underground, just outside of King’s Cross station, with one of the bombers on board. Rather than being political or vindictive, this is a personal story of a traumatising experience, with surreal, spiritual and sometimes even comical twists." Enker was interviewed by the Paris online comics magazine Trame 9 and explained what motivated his planned trilogy Neshuma, the Yiddish word for "soul" which he discovered in Will Eisner’s last graphic novel, The Plot. "I went on/off trying to get my autobiographical story started from when I was 25 or so, but work, life and love got in the way. Only after I moved to London in 2005 and realised I only had one life, one chance, to do what I wanted to do, so I started on this project Neshuma. Now I have no choice but to continue on this path." The first part is called In Transition because the story takes place half underground and half above ground, the stage between light and dark, life and death, between ignorance and enlightenment. He opens with the jubilation in Trafalgar Square at the decision on July 6th that London will host the 2012 Olympics. That evening he winds down over drinks and dinner with his girlfriend Alice and then floats off into a shadowy dream sequence, woken by the morning alarm and sunshine. We then follow David minute by minute as he enters the tube and boards the train to work, along the way bumping into the bomber himself and musing on all his very different fellow passengers. Then after a shout of "Allahu Akbar!! ", the explosion is shown as an isolated black panel, the window of the tube carriage, and the strangely muted sound effect, "BOAFFFFF", then a feeling of flying as he see "clouds" through the glass. And then, the impact strikes and David’s, and every other passenger’s, world is plunged upside down into chaos and darkness. 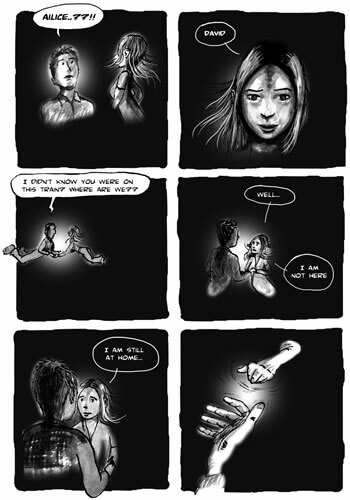 It’s over these next twelve spreads that he attempts to convey his experiences and feelings, both physical and mental. At first, Alice seems to come to him through the smoke, speaking in reversed-out, white-on-black balloons, and saying as they float and she drifts from his conscious, "I don’t want you to go", "Not yet", "I don’t want to be alone". There is heart-thumping, body-freezing panic: "This is it, I’m going to die now"; the shouts, coughs and screams on a spread reminiscent of Raymond Briggs; and then the sort of crazy musings that come to you near death - "No flashbacks or anything… no bright light at the end of the tunnel." That reference to a cliché of the afterlife and heaven does come true though, when out of the pitch black the first torchlight reaches him and he and the rest are led back to the surface. Before that, what gives him hope is that same image of Alice from earlier in the story, which gives him the determination to survive. Blinding light fills the final two blank pages as through it all the two of them find each other again. 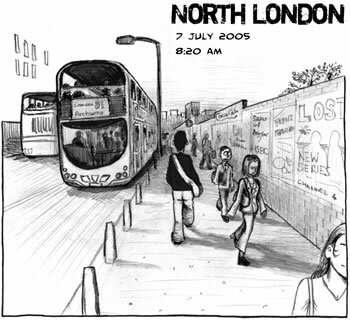 This is the first comic I’ve come across about the 7/7 bombings. David Enker’s cartoonish drawings start out shaded in soft, sensitive pencil, shift to ink and wash and then are enhanced with dry brush and charcoal to convey the smoky environment. 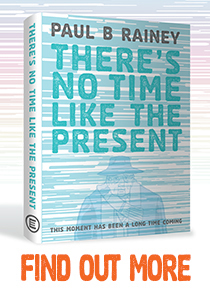 This survivor’s tale does not claim or aspire to be another Maus, Barefoot Gen or Persepolis, but in the very modesty and honesty of his drawing and writing David brings a real conviction to get across this extraordinary, life-changing, life-renewing event, to us and to himself. 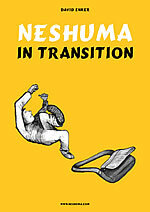 His site is Neshuma You can read a preview of the book online here and buy it at Lulu.com.